A sure sign of the album catching my attention is when after I am over listening to the said album I go on that particular style binge and revisit many of the acts in the same genre as the artist in question. With Californians Einvera I had to uncork the quirky side of my collection. And as many of those bands sound nothing like each other I caught myself thinking who Einvera resembles the most. The ultimate compliment then was the conclusion that this talented trio has their own face and position in metal. They do use a whole bunch of “weird” instruments (banjo, vibraphone, accordion, mandolin, glockenspiel, toy piano) like Estradasphere, but Einvera is tons heavier and not instrumental. With the strings often a prominent part of their music, they can be compared to Grayceon, but the San Franciscans are quite a bit more sludgy, reserved and introverted, when Einvera is full of thrashing energy and emotion. They are certainly not as chaotic as Sleepytime Gorilla Museum, so the closest analogy I could come up with was unexpecT, but In Your Image songs would be a lot easier to follow and get into than anything unexpecT has ever written. Diablo Swing Orchestra and even Sigh without all of its symphonics are also rather relevant references. To say that Einvera plays avant-garde blackened thrash and weaves a number of discernible polarizing influences in their music would be a fair assessment of In Your Image then. Whatever the complex rhythm changes, whatever the transitions (from blasting extreme metal to prim and proper dance on Invariably Transient), Einvera never loses sight of their metal roots and always comes through with the songwriting which ultimately makes sense. Whether it is a tragic violin lead off into prog on the title track, both most brutal and most gentle The Gift of a Ghost or the American folk, rockabilly, mandolin led instrumental Send Me Home, there is plenty of heavy meats-and-potatoes blackened thrash underneath its all to counterbalance all of the spices thrown into this jambalaya. Nowhere the synergy sounds better than on the opener Static Ascension where urging appealing violin is the perfect lead instrument announcing all of the quirkiness to follow amidst the more traditional black metal. The guys in Einvera must have some sort of musical education behind them. There is no way somebody totally amateur puts together so complex yet so professional sounding record. At times, with all of their time signatures shift and jazzy references you get an impression of a more ‘corish Atheist playing, and when the production calls for a big sounding moment, the opening horns of Let In Without a Name speak Italy, Florence or Venetian channels. Then there is vocals. Grant, who is the multi-instrumentalist here, delivers them on both clean-but-just-about-to-lose-it level, while his harsh voice sounds both throaty and woven into the song fabric, something Mikael Stanne gave on the older Dark Tranquillity albums. 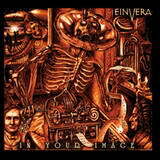 This vocal approach is another link for Einvera between all of their eccentricity and the extreme metal origins. However simplistic or convoluted my description of In Your Image was, you almost owe it to yourself to give this one a chance to indulge in its uniqueness and your ability to decipher whether the Einvera jigsaw puzzle holds together.